We saw an unbelievable end on this week SmackDown where "The Viper" Randy Orton ended the show by pinning AJ Styles with RKO to secure the final entry into the chamber match at this Sunday PPV. It will be interesting to see whether "The Legend Killer" will utilise this opportunity or not. The other thing which we will have to watch out for on this Sunday PPV is how 'The Queen', Charlotte Flair play mind game as on in this week edition of SmackDown she told that she would be sitting in the front row to watch Ronda Rousey defend her title against Ruby Riot. Charlotte has replaced Becky Lynch for Raw Women's Championship at Wrestlemania. WWE SmackDown Results Feb 12 2019: Winners, Highlights, Full Analysis and Commentary. Also, this weekend at Elimination Chamber PPV, Raw Women's Tag Team Champion will be crowned first time in an elimination chamber match. Even the determined Finn Balor will fight for Intercontinental Championship belt in a handicap match against Bobby Lashley & Lio Rush, it will be interesting to see whether the Irish Boy come out victorious or not. This Sunday might turn out a nightmare for Baron Corbin as he will be fighting Braun Strowman in a no disqualification match. This past week on SmackDown The USOS super kicked the Miz and Shane McMahon in McMiz TV. It will be interesting to see how the current tag team champions react to it while defending their title against The USOS. WWE RAW Results Feb 11 2019: Monday Night Winners, Highlights, Full Analysis and Commentary. 1. Daniel Bryan will retain his WWE title by winning the Elimination Chamber match. 2. Ronda Rousey will continue to remain WWE Raw Women's Champion, as she will beat down Ruby Riot sending out a brutal message to Charlotte Flair. 3. Sasha Bank and Bayley will be crowned the first Tag Team to win the women's tag team title in Elimination Chamber match. 4. Finn Balor will somehow win the Intercontinental Champion. 5. 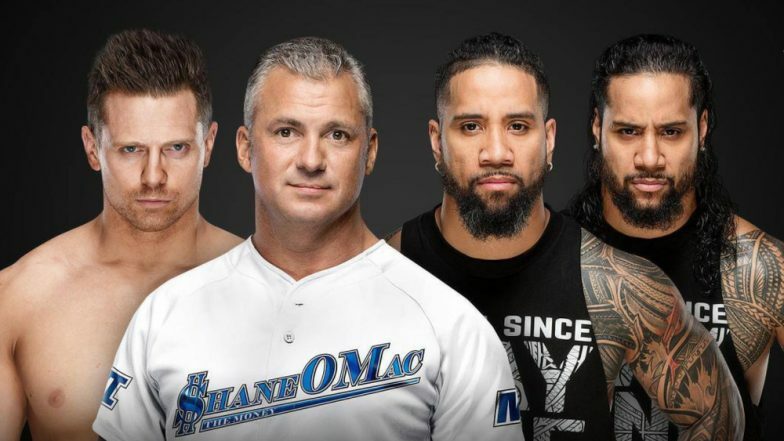 The Miz and Shane McMahon will take their revenge on The Usos by thrashing them down to retain their tag team title. Location: Toyota Center, Houston, Texas, United States. Day and Date: Sunday, February 17th, 2019. Where to Watch WWE Elimination Chamber Through Online Streaming: WWE Raw can be watched online by subscribing to WWE Network. When and Where to Watch WWE Elimination Chamber in India: WWE Elimination Chamber can be viewed live on Ten 2 and Ten 2 HD in India. The pre-show will telecast live at 4:30 AM and the main show will be live from 5:30 AM IST on Feb 18, 2019.